Every year as a teacher I set goals for myself…usually that goal includes being more organized and making my classroom as kid-friendly as possible. “Okay,” I said nervously. At the end of the day on Friday I told 23 children…”On Monday we’re going to have a surprise!” And so, with a tall glass cage I took the hamster to my apartment for the weekend. I placed him on top of my wooden table in the living room. The cage didn’t have a proper top, but, I figured he would be fine for the time being (N thought so too!). Needless to say, I did not sleep well Friday night. I woke up at three in the morning to see the little guy scurry across the kitchen floor behind the fridge. “Maybe I can trap him!” To no avail as he ran behind the fridge to an unknown destination. I tried to go back to sleep. On Saturday I went to the gym to try to forget about my little fiasco. “I am going to make a terrible mother,” I thought to myself. “Promising children things and then not following through.” And, not to mention N is going to kill me! I tried to reason with myself. I can always go to the market, buy another hamster, and no one will know the difference. The thought, however, of finding a dead rodent with a trail of poop in my kitchen cupboard did little to appease my fears. I grabbed my wallet…and my keys (of course), and with my heart racing, afraid it was going to somehow escape in the ten minutes I was gone, ran off to the market to buy a new cage. How is it that I’m not afraid to walk the streets of Mexico City late at night (in safe neighborhoods of course), hitchhike (um…only when I trust my intuition? :), cage fight, but picking up this maldito little hamster scares the begeezus out of me? 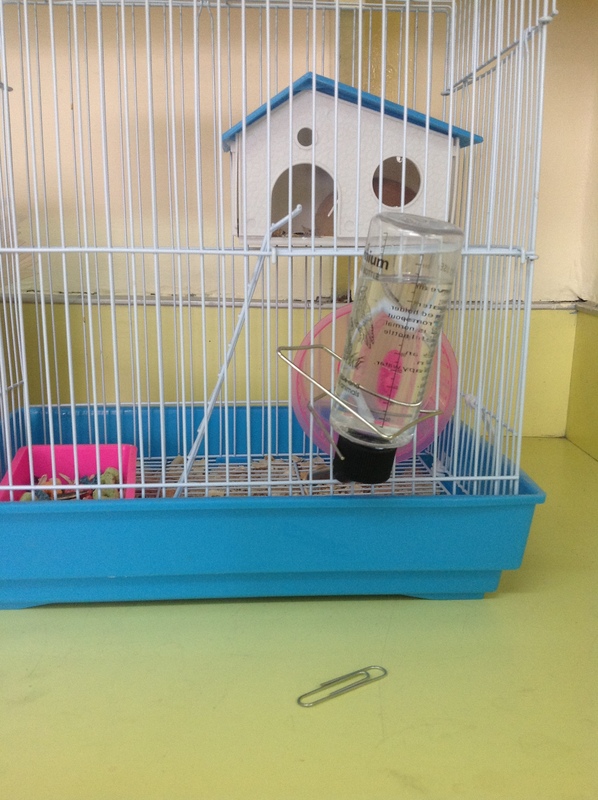 This entry was posted in Mexico and tagged class pet, learning, teaching. Bookmark the permalink. I just LOVE this! A far cry from our first kitten, do you remember? You were five. I had just knitted a tiny round rug for your doll house. I tucked you into bed, and you snuggled close to me while I read you a story. The tiny black kitten, Alayah, rushed into the bedroom, found your dollhouse and curled right up on that little rug. Between the two of you, so adorable! I used to flick you on the nose BEFORE you bit– kind of a preemptive strategy. And it worked! You cried a lot but never bit me.